VNRE – Tokyu Corporation – Japan, on February 27, signed a contract to become strategy partner with Becamex IDC Corporation. The joint venture company – Becamex Tokyu Co, Ltd. will develop an urban development named Tokyu Binh Duong Garden City in Binh Duong New City with total investment capital about of $1,2 billion. Tokyu Binh Duong Garden City has total land area of 71,45 hectares, consisting of approximately 7,500 housing units, commercial facilities, business facilities and amusement parks. 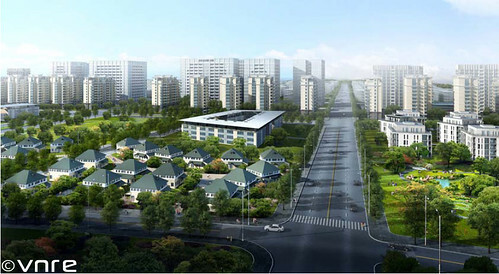 As planned, the Tokyu Binh Duong Garden City project will be broken ground on March 2, 2012. The Tokyu Corporation, also known in Japanese as Tōkyū Dentetsu for short, is a major private railway operator in the Greater Tokyo Area of Japan. Its headquarters are in Shibuya, Tokyo. It was formed on September 2, 1922 as the Meguro-Kamata Electric Railway and was later known as the Tokyo-Yokohama Electric Railway before gaining its current name in 1943. From 1944 to 1948, it also owned the companies now known as the Keihin Electric Express Railway, Keio Corporation, and Odakyu Electric Railway. During this time, it was colloquially known as Dai-Tokyu (lit. Great Tokyu). Investment and Industrial Development Corporation ( Becamex IDC) was established in 1976, over 35 years of construction and development, Becamex IDC has now become a prestigious brand name in the field of investment and development of industrial, residential, urban and transportation infrastructure. According to a future-oriented planning, Binh duong will be upgraded to become one of the centrally-controlled municipalities in Vietnam by 2020. 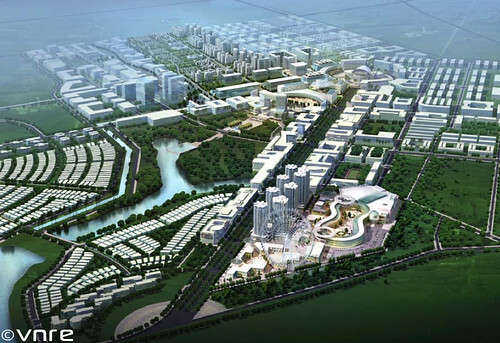 Therefore, to ensure development in accordance with the approved master plan, a new urban area of 1,000 ha in the complex is built to become a modern, civilized center district of Binh Duong in the future. This locality has been chosen to be a political and administrative center of Binh Duong by Provincial Party Committee, People’s Committees and People’s Council with a high level of consensus. In order to complete the detailed planning of 1/500 scale with respect to modern style for this new urban area,Becamex IDC has invited the Institute of design and architect consulting from National University of Singapore (NUS) to implement this plan. The new urban will become political – economic, cultural, social center of the entire province. The modern and urban center will be ready to serve more than 125,000 inhabitants and over 400,000 people working here. Complying with the approved planning, Becamex IDC has built modern infrastructure and public transportation system to easily connect with other nearby provinces and cities. In addition, Becamex IDC has organized a number of marketing activities to call for investment in the new urban area from experienced and prestigious domestic and foreign investors with a potential financial capacity. Besides the administrative center is being constructed, some items such as Lucky Square conference center, ecology lakes, central park 120 hectares completed, and the Eastern International University scale 24,000 students began the first course. In addition, the projects of town house, apartment, villa were built and some of them officially welcomed the first residents of the new city to live. VNRE – There are signs of loosening credit for the property market, but the effect so far is not strong enough to wake up the long hibernating capital market. Grayness still covers the real estate market in early 2012. Because of lack of capital, some projects have been forced to sell off, and many others are considering it. Therefore, in the near future, some projects are going to be divested. However, this is good opportunity for foreign investors to affirm their fame and take part in the Vietnam real estate market by replacing divested projects with their own. When real estate market loses its liquidation for a long time, most of real estate projects have to suffer from the loss for paying interest, especially for luxurious apartment projects, liquidation capacity becomes unreachable. But in reality, customers mainly focus on products with price of below VND2 billion. Because of the tightening credit policy promulgated by the State Bank of Vietnam, many real estate companies are in trouble with capital mobilisation, additionally, negative effects of global economic downturn, high inflation rate and intensively fluctuated construction costs become the extreme burden for real estate companies, which do not possess a strong financial power. While many completed projects can not to be bought by any customer, many real estate companies tend to sell or transfer part or all of their projects to foreign investors. In fact, Cuoc Cuong Sai Gon Company became a specific example pursuing to sell 65 percent (equivalent to VND121.2 billion) to Capita Value Homes Company, a subsidiary of Capita Land Group. Furthermore, this company also buys many other projects form Vietnamese investors. Besides that, the Japanese Tama Home Group also marked its appearance in buying 20 percent of shares of Cotec Investment and Land-house Development Joint-stock Company, a member of Cotec Group. Whilst many Vietnamese real estate companies are distressed by the frozen real estate market, some foreign investors are still confident to invest in Vietnam market. Particularly, in 2011, Indochina Capital – one of the leading real estate investment funds of Vietnam with annual revenue of US$40 million committed to continuously invest in many projects of Vietnam in 2012. Mr Peter Ryder – Chief Executive Officer of Indochina Capital believes that recent difficulties of Vietnamese real estate companies have become opportunity for further development of Indochina Capital. According to him, the range of market demands is still large, especially projects with right location and competitive price are still concerned by customers. Foreign investors also have the same point of view that after recently frozen period, Vietnam real estate market will become warmer and strongly develop. The opened outlet for domestic real estate companies will invisibly create a very bad and dangerous precedent for real estate market because of not only economic matters but also security factors. Mr Nguyen Huu Cuong said: “If domestic real estate companies cannot find the way to unify, some better off investment projects would be transferred to foreign investors. And this situation cannot be controlled, because we are in the integration process. In the next few years, what will happen if projects with prior location belong to foreign investors”. Accordingly, if companies do only care for themselves, they would not survive. The hardship will filter weak companies, but is it enough to build up the big domestic real estate groups, which are able to compete with foreign companies? Pursuing to some experts, domestic companies would rather unify and cooperate with each others to support resources among them than sell projects as retailers. 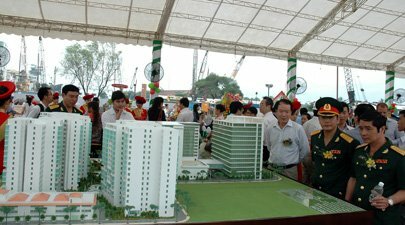 VNRE – Aircraft Repairing Company A-41 under the Ministry of Defense and Kinh Do Real Estate Company (Kinh Do Land) on Wednesday kicked off construction of an apartment, office and commercial complex in HCMC’s Tan Binh District. The Cong Hoa Garden project worth around VND1.5 trillion covers around three hectares on Cong Hoa Street in Tan Binh District. Consisting of five 13- to 15-floor blocks, the project has a total floor space of around 130,000 square meters, with 970 apartments and nearly 15,000 square meters of office space plus a retail section of 12,000 square meters. The first phase of the project set for completion after two years of construction includes 216 serviced apartments having 50-89 square meters each and three floors of commercial center. Tran Cao Thanh, deputy general director of Kinh Do Land, said that the firm would start selling apartments of the project in the fourth quarter with a price of VND17-18 million per square meter. In related news, several condo developers are switching part of their commercial apartments into serviced condo for lease now that sales have almost stalled. Several commercial apartment projects such as the XI Riverview Palace, the Vista in District 2 and Ben Thanh Luxury Apartments in District 1 are being switched into serviced ones. According to CB Richard Ellis Vietnam (CBRE), this segment is having nearly 800 Grade-A apartments, around 2,500 Grade-B apartments and 1,000 Grade-C apartments with an average monthly rent of US$36.5, US$26 and US$17.5 per square meter respectively. Tenants have now tended to choose smaller apartments with fewer bedrooms to save costs and shift from the city’s downtown to districts 2, 7 and Binh Thanh District. The future supply will focus on small boutique projects in the city’s downtown, and the market will continue to face tough competition in the villa and apartment-for-rent segments, according to CBRE. These will help stabilize and lower the leasing price of many projects. VNRE – Keppel Land has signed a conditional agreement with Takashimaya Singapore Ltd (“Takashimaya”), a subsidiary of Takashimaya Co., Ltd (“Takashimaya Co.”), to pre-commit approximately 15,000 sm of retail space across five floors of Saigon Centre Phase 2. With Takashimaya coming onboard as anchor tenant, about 30% of the total retail area is pre-leased ahead of the development’s expected completion in 2015. This agreement comes shortly after the groundbreaking of the integrated mixed-use development in November last year. It marks Takashimaya’s foray into the lucrative Vietnamese retail market and is part of its strategy to further expand into Asia. Mr Kevin Wong, Group CEO of Keppel Land, said, “We are pleased that Takashimaya has selected Saigon Centre as its choice location for its first retail mall in Vietnam. This further establishes Saigon Centre as the place to be and preferred address for quality tenants. An established and quality brand in the industry, Takashimaya will complement and enhance the overall retail offerings at Saigon Centre and HCMC as a whole. 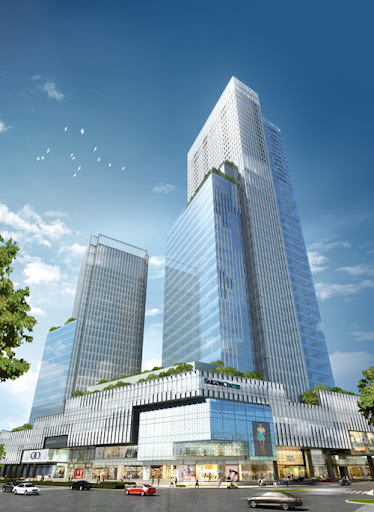 At the same time, Toshin Development Co., Ltd (“Toshin Development”), the real estate subsidiary of Takashimaya Co., has entered into a share-purchase agreement with Keppel Land to hold 22.7% stake in Saigon Centre Phase 2. Keppel Land will also jointly establish a 50:50 retail management company with Toshin Development Singapore Pte Ltd, the Singapore subsidiary under Toshin Development, to provide retail management services for Keppel Land’s projects in Vietnam. Toshin’s expertise and skills in retail mall development will ensure that we continue to adopt best-in-class approach that will ensure operational excellence at Saigon Centre. Strategically located along Le Loi Boulevard in the heart of HCMC’s CBD, Phase 1 of the award-winning Saigon Centre was completed in 1996 and has established itself as the preferred shopping destination and a business address for diplomatic corps, multi-national companies as well as banking and financial institutions. Currently under construction, Phase 2 of Saigon Centre is designed by internationally renowned architect, NBBJ based in New York. When fully completed in 2015, it will stand tall at 45 storeys with seven levels of retail and dining spaces spread across 50,000 sm; 40,000 sm of premium Grade A office space, and over 200 units of luxury serviced apartments. The proposed joint establishment of the retail management company is not expected to have any material impact on the earnings per share or net tangible assets per share of the Company for the current financial year. Building on a growing relationship that spans more than two decades, Keppel Land is one of the largest foreign real estate investors in Vietnam. Named the Best Developer in Vietnam in 2010 by Euromoney, a leading global financial magazine, Keppel Land has a quality portfolio of properties in Hanoi, Ho Chi Minh City, Dong Nai and Vung Tau including Grade A offices, residential properties, integrated townships and award-winning serviced apartments. To-date, Keppel Land has 18 projects in Vietnam, with a total investment capital of almost USD 2 billion and a pipeline of about 22,000 homes. Takashimaya Singapore Ltd was established in 1993. It is Singapore’s largest department store that spans 35,000 square meters and the Singapore’s leading store operator in terms of turnover. It is the anchor tenant of Takashimaya Shopping Centre, located along the country’s premium shopping belt, Orchard Road. In 1963, Toshin Development Co Ltd was founded by its parent company, Takashimaya, to develop the first authentic suburban shopping centre in Japan. Since the opening of the Takashimaya Shopping Centre in Ngee Ann City in Orchard Road in 1993, it has been maintained by Toshin as the No.1 luxury shopping centre in Singapore. Toshin Development Singapore Pte. Ltd. was incorporated in Singapore as a subsidiary company from a branch office in 2010 to further enhance the operation of the overseas business in Southeast Asia. VNRE – Hanoi authorities have decided to restructure Trang Tien Plaza, the mall with the prime location on the corner of Hoan Kiem Lake. The restructuring was initiated by the State Capital Investment Corporation and has been approved by the Hanoi People’s Committee. The aim is to improve efficiency as well as upgrading the building including how it fits it surroundings. In particular, however, it is the products on sale that will change with the new emphasis split between world brands and Vietnamese traditional products. “It is necessary to work with the representatives of people in the Plaza and get their input,” said the chairman of Hanoi People’s Committee Nguyen The Thao. Thao also stressed that the upgrading of the building must follow current laws on architecture planning management, investment and construction. Agreeing with the proposal, deputy chairman of the Hanoi People’s Committee Nguyen Huu Tuong said he expects the building will be turned into a modern trade centre with national stature, deserving of its special location in the centre of the capital of Vietnam. Tuong said that the Trang Tien Investment and Trade Company and the partners who join the investment and upgrading of Trang Tien Plaza must not lose the traditional characteristics of the previous “Bach hoa tong hop” (General Department Store) which has been familiar to many generations of Hanoians. Trang Tien Plaza, which is located on the land where Bach hoa tong hop once existed, opened in early 2002 under the joint management of the Vietnam Construction Import-Export Corporation (Vinaconex) and the Hanoi Trade Corporation. Set on the corner of Hoan Kiem lake and with Trang Tien, Hang Bai and Hai Ba Trung on three sides, the 20,000 square meter trade centre is expected to play a key role in defining the capital in a period of change. 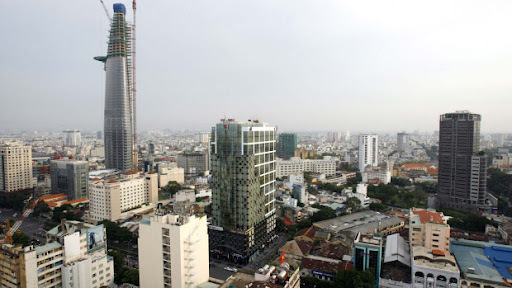 VNRE – The 40-storey BIDV Tower will rise elegantly into the skyline of Ho Chi Minh City, the latest symbol of the Vietnam’s economic prowess, according to the architect’s plans. But the reality is rather less lofty. In a property market hit hard by economic instability, building on the project, backed by the state-owned Bank for Investment and Development of Vietnam, has stalled. The prime plot in Vietnam’s commercial capital, formerly known as Saigon, is one of several fallow building sites that have been turned into temporary car parks, where office workers pay 5,000 dong ($0.24 U.S.) a day to keep their scooters. VNRE – Tan Hoang Minh Group and Ha Noi Housing Management and Development Company unveiled plans for a luxury residential complex on Ha Noi’s Nguyen Van Huyen Street in Cau Giay District. The VND4 trillion building will cover a ground area of 4,800 sq.m. 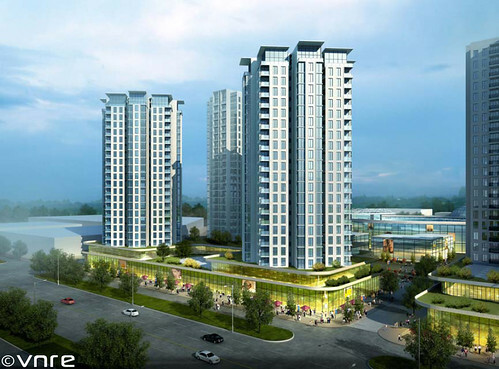 Prices are estimated to reach VND100 million (US$5,000) per sq.m. 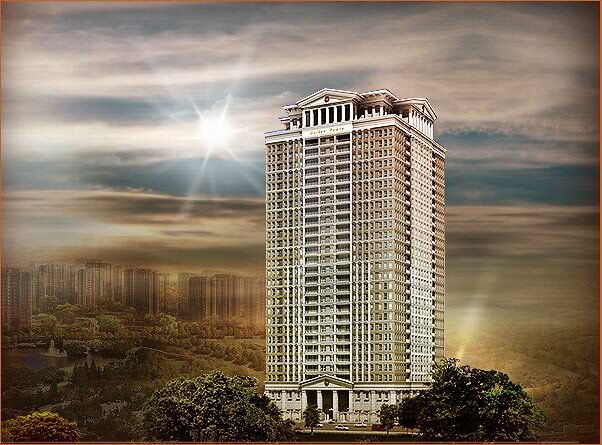 The D’Palais de Louis will be 27 storeys tall with an additional four floors underground. It will offer 242 residential apartments ranging from 120-260 sq.m. Tan Hoang Minh said the building, which will have two swimming pools and two service centres in the lobby, would be completed and available for sales by 2014.